Note that, in addition to this page's information, other results and achievements are included within the monthly newsletter. Also, be aware that most of the material on this page is provided as a downloadable PDF file. 26/12/2018 - Results Women & Juveniles and Results Men from St. Stephen's Day Road Race. 02/12/2018 - Masters & Junior Results & Juvenile Development Results from Day 4 Laois Cross Country Championships in Kilcavan. 04/11/2018 - Senior Results & Relay Results from Day 3 Laois Cross Country Championships in Emo Court. 14/10/2018 - Results from Day 2 Laois Cross Country Championships - Intermediate & Even Age groups held in Abbeyleix. 30/09/2018 - Results from Day 1 Laois Cross Country Championships - Novice & Uneven Age groups held in Tolerton. 15/08/2018 - Results from ROUND 8 of the Fit4Life Summer League 2018 held at St Abban's AC, Monavea. 01/08/2018 - Results from ROUND 7 of the Fit4Life Summer League 2018 held in Graiguecullen. 18/07/2018 - Results from ROUND 6 of the Fit4Life Summer League 2018 held in Ballylinan. 04/07/2018 - Results from ROUND 5 of the Fit4Life Summer League 2018 held in Moneenroe. 20/06/2018 - Results from ROUND 4 of the Fit4Life Summer League 2018 held in Wolfhill. 23/05/2018 - Results from ROUND 2 of the Fit4Life Summer League 2018 held in Rossmore. 09/05/2018 - Results from ROUND 1 of the Fit4Life Summer League 2018 held in Luggacurren. 07/05/2018 - Results of our 23rd Open Sports. 22/04/2018 - Results of our 45th Student Games. 26/12/2017 - Results Women and Results Men from St. Stephen's Day Road Race. 15/11/2017 - Results 1 & Results 2 from Day 3 Laois Cross Country Championships - Laois Masters, Junior and Juvenile Development. 15/10/2017 - Results from Day 2 Laois Cross Country Championships - Intermediate & Even Age groups held in Abbeyleix. 01/10/2017 - Results from Day 1 Laois Cross Country Championships - Novice & Uneven Age groups held in Rosenallis. 18/08/2017 - Results from ROUND 8 of the JF Sports Fit4Life Summer League 2017 held at St Abban's Club grounds. 02/08/2017 - Results from ROUND 7 of the JF Sports Fit4Life Summer League 2017 held in Graiguecullen. 19/07/2017 - Results from ROUND 6 of the JF Sports Fit4Life Summer League 2017 held in Ballylinan. 05/07/2017 - Results (updated) from ROUND 5 of the JF Sports Fit4Life Summer League 2017 held in Moneenroe. 21/06/2017 - Results from ROUND 4 of the JF Sports Fit4Life Summer League 2017 held in Wolfhill. 07/06/2017 - Results from ROUND 3 of the JF Sports Fit4Life Summer League 2017 held in Newtown. 24/05/2017 - Results from ROUND 2 of the JF Sports Fit4Life Summer League 2017 held in Rossmore. 10/05/2017 - Results from ROUND 1 of the JF Sports Fit4Life Summer League 2017 held in Luggacurren. 01/05/2015 - Results of the 22nd Annual Open Sports held at St Abban's AC track. 19/01/2017 - Results from the 9th. Annual St Abban's AC Table Quiz held in The Grove Lounge, Tolerton. 11/12/2016 - DRAW 3 - Club Members Draw 2016 - held in Behan's Pub, Tolerton. 20/11/2016 - Results from DAY 4 of the Laois County Cross Country Championships held in Stradbally Estate. 20/11/2016 - DRAW 2 - Club Members Draw 2016 - held in Behan's Pub, Tolerton. 06/11/2016 - Results from DAY 3 of the Laois County Cross Country Championships held in Emo Court. 09/10/2016 - Results from DAY 2 of the Laois County Cross Country Championships held in Abbeyleix. 25/09/2016 - Results from DAY 1 of the Laois County Cross Country Championships held in Mountmellick. 14/09/2016 - LAOIS PRIMARY SCHOOLS Cross Country Championships were held in O'Dempseys GAA grounds Click here for results from the day. 19/08/2016 - Results from ROUND 8 of the JF Sports Fit4Life Summer League 2016 held St Abban's AC Monavea. 03/08/2016 - Results from ROUND 7 of the JF Sports Fit4Life Summer League 2016 held in Graiguecullen. 20/07/2016 - Results from ROUND 6 of the JF Sports Fit4Life Summer League 2016 held in Ballylinan. 06/07/2016 - Results from ROUND 5 of the JF Sports Fit4Life Summer League 2016 held in Moneenroe. 22/06/2016 - Results from ROUND 4 of the JF Sports Fit4Life Summer League 2016 held in Wolfhill. 08/06/2016 - LAOIS PRIMARY SCHOOLS Track & Field Championships were held in Tullamore Harriers Click here for results from the day. 08/06/2016 - Results from ROUND 3 of the JF Sports Fit4Life Summer League 2016 held in Newtown. 27/05/2016 - Results from DAY 2 of the Laois T&F; Championships held in St Abban's Sports Complex, Monavea. 25/05/2016 - Results from ROUND 2 of the JF Sports Fit4Life Summer League 2016 held in Rossmore. 19/05/2016 - Results from the Laois Secondary Schools T&F; Championships held in St Abban's Sports Complex, Monavea. 11/05/2016 - Results from ROUND 1 of the JF Sports Fit4Life Summer League 2016 held in Luggacurren. 06/05/2016 - Results from DAY 1 of the Laois T&F; Championships held in St Abban's Sports Complex, Monavea. 26/04/2016 - Results of the the 43rd Student Games 2016 which took place at St Abban's track. 24/04/2016 - Results from the Laois County Masters Road Championships held in Portarlington. 09/04/2016 - Results from the Laois County Indoor Track & Field Championships held in Nenagh Indoor Track. 03/04/2016 - Results from the Laois County Senior Road Championships held in Vicarstown. 10/03/2016 - Results from the 31st Annual National Schools Table Quiz final sponsored by Dineen Refractories ,Wolfhill held in Kileen Hall. 28/02/2016 - Results from the Laois County Intermediate Road Championships hosted by Rosenallis/Kilcavan, held in Kilcavan. 21/02/2016 - Results from the Laois County Novice Road Championships hosted by Oughaval AC, held in Vicarstown. 21/01/2016 - Results from the 8th. Annual St Abban's AC Table Quiz held in The Grove Lounge, Tolerton. 20/01/2016 - Results from the Laois Secondary Schools Cross Country Championships held in O'Dempseys GAA Grounds. 11/10/2015 - Results from the Laois Credit Unions County Cross Country Championships (Uneven Ages) & Intermediate held in Cullahill. 27/09/2015 - Results from the Laois Credit Unions County Cross Country Championships (Even Ages) & Novice held in Kilcavan. 21/08/2015 - Results from ROUND 8 of the JF Sports Fit4Life Summer League 2015 held at St Abban's AC, Monavea. 06/08/2015 - Results from ROUND 7 of the JF Sports Fit4Life Summer League 2015 held in Graiguecullen. 22/07/2015 - Results from ROUND 6 of the JF Sports Fit4Life Summer League 2015 held in Ballylinan. 08/07/2015 - Results from ROUND 5 of the JF Sports Fit4Life Summer League 2015 held in Moneenroe. 24/06/2015 - Results from ROUND 4 of the JF Sports Fit4Life Summer League 2015 held in Wolfhill. 10/06/2015 - Results from ROUND 3 of the JF Sports Fit4Life Summer League 2015 held in Newtown. 27/05/2015 - Results from ROUND 2 of the JF Sports Fit4Life Summer League 2015 held in Rossmore. 13/05/2015 - Results from ROUND 1 of the JF Sports Fit4Life Summer League 2015 held in Luggacurren. 04/05/2015 - Results of the 20th Annual Open Sports held at St Abban's AC track. 12/03/2015 - Results from the 30th Annual National Schools Table Quiz final sponsored by Dineen Refractories ,Wolfhill held in Kileen Hall. 01/02/2015 - Results from the Laois Novice Road Championships hosted by St Michael's AC, Fisherstown. 22/01/2015 - Results from the 7th. Annual St Abban's AC Table Quiz held in The Grove Lounge, Tolerton. 22/01/2015 - Results from the Laois Secondary Schools cross country held in O'Dempseys GAA Grounds. 30/11/2014 - DRAW 3 - Club Members Draw 2014 - held in Behan's Pub, Tolerton. 30/11/2014 - Laois Cross Country 2014 - Results from the Laois Credit Unions Masters and Juvenile Development county Championships held in Barrowhouse. 02/11/2014 - Results from the Laois Credit Unions Senior, Junior and Juvenile Relays County Cross Country Championships (Uneven Ages) held in Stradbally. 01/11/2014 - DRAW 2 - Club Members Draw 2014 - held in Leech's Pub, Wolfhill. 12/10/2014 - Results from the Laois Credit Unions County Cross Country Championships (Uneven Ages) & Intermediate held in Cullahill. 11/10/2014 - DRAW 1 - Club Members Draw 2014 - held in The Glenside, Killeshin. 05/10/2014 - Day 1 - Laois Cross Country 2014 - Results from the Laois Credit Unions County Cross Country Championships Even Ages & Novice held in Emo. 22/08/2014 - Results from STAGE 8 of the club Fit4Life Summer League 2014 held in St Abban's AC, Monavea. 06/08/2014 - Results from STAGE 7 of the club Fit4Life Summer League 2014 held in Graiguecullen. 23/07/2014 - Results from STAGE 6 of the club Fit4Life Summer League 2014 held in Ballylinan. 09/07/2014 - Results from STAGE 5 of the club Fit4Life Summer League 2014 held in Moneenroe. 02/07/2014 - Results from Day 3 Laois Development Track and Field Championships held at St Abban's AC sports grounds. 25/06/2014 - Results from STAGE 4 of the club Fit4Life Summer League 2014 held in Wolfhill. 11/06/2014 - Results from STAGE 3 of the club Fit4Life Summer League 2014 held in Newtown. 11/06/2014 - LAOIS PRIMARY SCHOOLS TRACK AND FIELD 2014 were held in Tullamore Harriers Click here for results from the day. 28/05/2014 - Results from STAGE 2 of the club Fit4Life Summer League 2014 held in Rossmore. 25/05/2014 - Track and Field Results of Day 2 of the LAOIS CREDIT UNIONS Track & Field Championships held at Tullamore Harriers track. 14/05/2014 - Results from STAGE 1 of the club Fit4Life Summer League 2014 held in Luggacurren. 09/05/2014 - Results of Day 1 of the LAOIS CREDIT UNIONS County Championships Track & Field held at St Abban's AC track. 05/05/2014 - Results of the 19th Annual Open Sports held at St Abban's AC track. 27/04/2014 - Results from this year's Laois Masters Road Championships held in Portarlington. 27/04/2014 - Results of the the 41st Student Games 2014 which took place at St Abban's track. 30/03/2014 - Results from this year's Laois Senior Road Championships which took place on the Turra triangle, (St Abban's AC). 14/03/2014 - Results from the Laois Indoor Championships held in Athlone. 12/03/2014 - Results from the 29th Annual National Schools Table Quiz final sponsored by Dineen Refractories ,Wolfhill held in Kileen Hall. 26/01/2014 - Results from the Laois Novice Road Championships held in Tolerton. 23/01/2014 - Results from the 6th. Annual St Abban's AC Table Quiz held in The Grove Lounge, Tolerton. 05/01/2014 - Results from the Laois Cross Country Championships Senior, Junior & Juvenile Relays. 24/11/2013 - DRAW 3 - Club Members Draw 2013 - held in Behan's Pub, Tolerton. 02/11/2013 - DRAW 2 - Club Members Draw 2013 - held in The Leeches Pub, Wolfhill. 20/10/2013 - Results from DAY 2 at the Laois Credit Unions County Cross Country Championships (Uneven Ages) & Novice held in Emo. 12/10/2013 - DRAW 1 - Club Members Draw 2013 - held in The Glenside, Killeshin. 06/10/2013 - Results from DAY 1 at the Laois Credit Unions County Cross Country Championships (Even Ages) & Masters held in Stradbally. 18/09/2013 - Results from the local Primary school's Cross Country championships held in St Abban's AC Sports Complex. 08/09/2013 - Results of the 22nd Annual Luggacurren 10Km Road Race held in Luggacurren, Co Laois and winners of the overall prizes. 30/08/2013 - Results from STAGE 8 of the club Fit4Life Summer League 2013 held in St Abban's AC, Monavea. 07/08/2013 - Results from STAGE 7 of the club Fit4Life Summer League 2013 held in Graiguecullen. 26/07/2013 - Results from Day 3 Laois Track and Field Championships and J.K. Malone Trophy held at St Abban's AC sports grounds. 24/07/2013 - Results from STAGE 6 of the club Fit4Life Summer League 2013 held in Ballylinan. 10/07/2013 - Results from STAGE 5 of the club Fit4Life Summer League 2013 held in Moneenroe. 26/06/2013 - Results from STAGE 4 of the club Fit4Life Summer League 2013 held in Wolfhill. 12/06/2013 - Results from STAGE 3 of the club Fit4Life Summer League 2013 held in Newtown. 12/06/2013 - LAOIS PRIMARY SCHOOLS TRACK AND FIELD 2013 were held at St Abban's track Click here for results from the day. 29/05/2013 - Results from STAGE 2 of the club Fit4Life Summer League 2013 held in Rossmore. 15/05/2013 - Results from STAGE 1 of the club Fit4Life Summer League 2013 held in Luggacurren. 10/05/2013 - Results of Day 1 of the LAOIS CREDIT UNIONS County Championships Track & Field held at St Abban's AC track. 06/05/2013 - Results of the 18th Annual Open Sports held at St Abban's AC track. 28/04/2013 - Results of the the 40th Student Games 2013 which took place at St Abban's track. 17/04/2013 - Results of the the Laois Secondary Schools Track & Field which took place at St Abban's track. 07/04/2013 - Results from this year's Laois Masters Road Championships held in Portarlington. 24/03/2013 - Results from this year's Laois Senior Road Championships kindly sponsored by Ben Brennan which took place on the Turra triangle. 02-03/03/2013 - Results from the U18 and U20 Scottish National Indoor Championships held in Glasgow. 27/01/2013 - Results from the Laois Novice Road Championships held in Tolerton. 24/01/2013 - Results from the 5th. Annual Table Quiz held in The Grove Lounge, Tolerton. 06/01/2013 - Results from the Laois Cross Country Championships Senior, Junior & Juvenile Relays held in Tolerton. 05/01/2013 - LEINSTER STAR AWARDS FOR 2012 - click here for the overall results. 18/12/2012 - Results from the Christmas Cracker 1 mile run held at St Abban's track, Monavea. 02/12/2012 - Results from the Laois Credit Unions County Intermediate and Development Cross Country Championships held in Ballyroan. 25/11/2012 - DRAW 3 - Club Members Draw 2012 - held in Behan's Pub. 03/11/2012 - DRAW 2 - Club Members Draw 2012 - held in The Leeches Pub, Wolfhill. 21/10/2012 - Results from DAY 2 at the Laois Credit Unions County Cross Country Championships (Uneven Ages) & Novice held in Emo. 13/10/2012 - DRAW 1 - Club Members Draw 2012 - held in The Glenside, Killeshin. 07/10/2012 - Results from DAY 1 at the Laois Credit Unions County Cross Country Championships (Even Ages) & Masters held in Stradbally. 09/09/2012 - Results of the 21st Annual Luggacurren 10Km Road Race held in Luggacurren, Co Laois. 19/08/2012 - NATIONAL LEAGUE 2012 FINAL - Results from the Woodie's DAY National League final 2012 held in Tullamore. 18/08/2012 - Results of the men's competition from the Woodie's DIY National Masters Championships held in Tullamore Harriers. 08/08/2012 - Results from STAGE 7 of the club Fit4Life Summer League 2012 held in Graiguecullen. 4&5/08/2012 - Results from the Woodie's DIY National Combined Events Championships held in Morton Stadium, Dublin. 26/07/2012 - Results and Points Table of the LAOIS CREDIT UNIONS Senior and J.K. Malone championships held at St Abban's AC track. 19/07/2012 - Results of the LAOIS CREDIT UNIONS Senior and 'B' Track & Field championships held at St Abban's AC track. 14&15/07/2012 - Results from the Woodies DIY National Juvenile Track & Field Championships held in Tullamore Harriers Stadium. 07&08/07/2012 - Results from the National Senior Track & Field Championships held in Morton Stadium Santry, Dublin. 24/06/2012 - Woodie's DIY AAI Track & Field Championships held in Tullamore Harriers Stadium. Click here for the results. 23/06/2012 - 6 Nations Walking Championships (small nations GBR-BEL-DEN-IRL-NED-SUI) held in Geneva, Switzerland. Click here for the results. 20/06/2012 - Paddy Fitzgerald Memorial Races held in Portarlington. Click here for the results. 13/06/2012 - LAOIS PRIMARY SCHOOLS TRACK AND FIELD 2012 were held at St Abban's track Click here for results from the day. 13/06/2012 - Results from STAGE 3 of the club Fit4Life Summer League 2012 held in Newtown. 27/05/2012 - Results from the Leinster Relays held in Tullamore. 16/05/2012 - Results from STAGE 1 of the club Fit4Life Summer League 2012 held in Luggacurren. 11/05/2012 - Results of the LAOIS CREDIT UNIONS Track & Field championships held at St Abban's AC track. 07/05/2012 - Results of the Mens and Womens Leinster Novice & Masters held in Gowran, Co Kilkenny. 07/05/2012 - Results of the Club Open Sports held at St Abban's AC track. 06/05/2012 - M3 Monavea Women's 5k Mini Marathon held in Monavea - click here for the official results. 22/04/2012 - Results of the the Primary Schools Annual Student Games 2012 which took place at St Abban's track. 01/04/2012 - Results from the Laois Masters Road Championships held in Fisherstown. 25/03/2012 - Results from this year's Ben Brennan sponsored Laois Senior Road Championships which took place on the Turra triangle. March 2012 - Results from the Dineen Refractories ,Wolfhill South Laois National Schools Table Quiz Final held in Arles Hall. 04/03/2012 - Results from the U18 and U20 Scottish National Indoor Championships held in Kelvin Hall, Glasgow. 29/01/2012 - Results from the Laois Novice Road Championships held in Portarlington. Results of the Laois Credit Union JK Malone Trophy event held on Wed 27th July 2011 in Monavea. Paddy Fitzgerald Memorial 1 Mile Runs held in Portarlington on Wed 22nd June 2011. Click here for the results. Results from the Leinster Senior and Master Championships held in Tullamore on Sunday 5th June 2011. Results of the Club Sports held on Monday 2nd May in the club grounds. Results of the the Primary Schools Annual Student Games 2011 which took place on Sunday 17th April in the club grounds. Results of the Laois Credit Union JK Malone Trophy event held on Wed 28th July 2010 in Monavea. Results from the St Abban's 2010 Annual Road Race held in Monavea on 20th August 2010. Results of the Laois Credit Union Senior Track and Field Championships held on Wed 28th July 2010 in Monavea. Results of the Laois Credit Union County "B" and Junior Track and Field held on Wed 14th July 2010 in Monavea. Results of the Laois Primary School's Track and Field held on 16th June 2010 in Monavea. Woodies DIY National League Track and Field Points Total and Individual Results held on 13th June 2010 in Tullamore. Results of the Masters Track and Field Championships held on 6th June 2010 in Tullamore. Results of the Seniors Track and Field Championships held on 6th June 2010 in Tullamore. Results of the Woodie's DIY All-Ireland Schools Track and Field Championships held on 5th June 2010 in Tullamore. 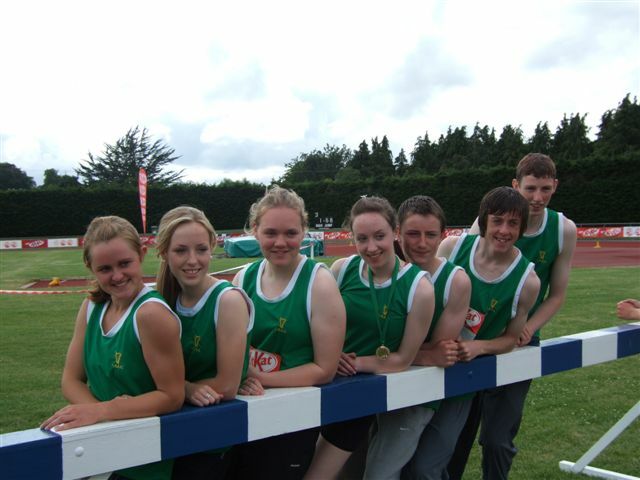 30th May 2010 - Results from the Juniors & U23s Track and Field Championships held in Tullamore. 29th May 2010 - Results of the U9-U11 Pairs and U12s Track & Field Championships held in Tullamore. 9th May 2010 - M3 Monavea Women's Mini Marathon held in Monavea - click here for the official results. Here are the results of the St Abban's AC Open Sports held in the club grounds on Monday 3rd May 2010. Results of the Leinster Novice and Masters Road Race - Monday 3rd May 2010 Gowran. Results of the the Primary Schools Annual Student Games 2010 which took place on Sunday 25th April in the club grounds. Results from Leinster Senior Men and Women 10Km Road Race held in Galbally, Wexford - 21st March 2010. Results from 25th Annual National Schools Table Quiz 2010 held in Arles Hall- 11th March 2010. Results from Leinster Senior & Junior cross country championships Kilmacow - 14th Feb 2010. Results from Scottish U17 - U20 Indoor Championships held in Glasgow - 13th Feb 2010. The results of Four County League are on the Four County webpage. Results for Fit4Life are on the Fit4Life page. M3 results are on the M3 website. Results from this year's JK Malone are now available. July 14th 2009 - Laois Credit Union Senior Track'n'Field and B Championship - results are here. 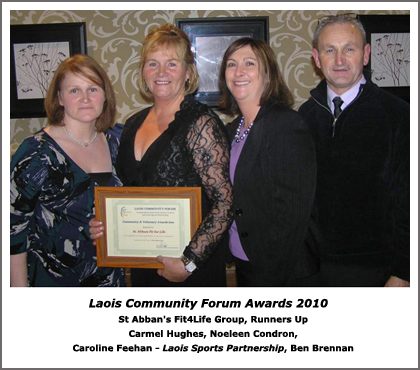 May 4th 2009 - Laois Sports Partnership - 14th Annual Sports Results. May 1st 2009 - Laois Credit Unions County Track'n'Field Championship. June 10th 2009 - Laois Primary Schools Track'n'Field. 36th Annual Student Games - April 26th, 2009 - full list of results. Laois Secondary School's Track'n'Field - sponsored by Laois Credit Unions - April 23rd, 2009. March 12th 2009 - 24th Annual National School's Table Quiz. Ballyroan - Jan 4th 2009 - results. Also, read about Claire, Brian and Dan all taking the top awards that day. St. Stephen's Day roadrace - results. The 2008 Dublin City Marathon had a great representation from the club. Here are the results of those who took part. Congratulations and well done to all of you. Results from the Primary School's cross country, held at the St. Abban's track on Wednesday 17th September, 2008. A glorious May Bank Holiday provided the backdrop to a fine day's athletics at the 13th Juvenile Open Sports, hosted by the club. Here are the full results. Congratulations to our Carlow neighbours, St. Laurence O'Tooles Athletics Club, on winning the Monavea Shield. The St. Abban's vs. Vicarstown inter-count match produced some fine performances from both clubs. Download the full results. The 2008 Student Games was won by Killeshin. Here are the full results, showing club athletes performing well for their local primary schools. The results of this year's National School table quiz are now on-line. Thanks to Pat Whelan for compiling these and running the Quiz for us. Results from the Laois Credit Unions Cross Country Championships held at Blandsfort's Estate, Ballyroan, January 6th, 2008. Results from the St. Stephen's Day Road Races held at Behan's, 26th December 2007. Results from the Second Day of the Cross Country Championships held at Emo Court, October 14th 2007. Results from the First Day of the Cross Country Championships held at Clonreher, October 7th 2007. Results from the 2007 Tolerton Road Races. We also have results for 2006 and 2005. ESB National League 2007 - Final Round results. Well done to the team in coming 2nd and securing promotion! Laois Credit Unions Track & Field â€“ County Senior â€“ Monavea, July 18th 2007. Laois Credit Unions Track & Field â€“ J. K. Malone Trophy â€“ Monavea, July 18th 2007. The results from the Open Sports, held June 29th, 2007 at the clubhouse. The U13-U19 Leinster Track & Field's at Tullamore, full results of all St. Abban's athletes. The 2007 Laois Primary Schools Track & Field Championships, held Wed 13th June, 2007. Note from the end of January, early February on novice and masters road races and recent schools cross county. Download and read Pat Kelly's January 2007 Club Diary, which includes recent results, achievements and activities. The results from the 2006 St. Stephen's Day Road Races show Claire Phelan and Colm Burke taking the honours. Some notes (as a PDF) on recent performances during July 2006. Great Performances at the 2006 Tailteann Games! - History was made in Tullamore on Saturday last, the 24th June, when SEVEN club members had the distinction of wearing the Leinster singlet in the Tailteann Games which is one of the oldest athletic events in the World. All performed very well and helped Leinster to 2nd in both the girls and boys competition (finishing runners up to Munster in the girls and to Ulster in the boys). Shauna Daly was our youngest performer and had a fine 4th in the discus and 7th in the shot. Aisling Kelly broke new ground with a P.B. of 29.66 for the 4kg hammer. Paul Byrne was 6th in the 100 hurdles. Francis Egan moved up to 12.50 for the triple jump when finishing 5th and was 6th in the long jump. Barry Pender, though not jumping to his normal high class, took the bronze for the high jump. Sinead Kelly had another fine run over 300 when taking the silver and came out later to lead Leinster to gold in the 4 x 300 in a new record time of 2-47.7 (one of two new records set on the day). Cheryl Nolan was a close 5th in the triple jump and then broke new territory when taking a full 8 seconds of her best when taking the silver over 1500 in a time of 4-40.5. Congratulations to all for representing your school and doing the club proud. Here's a great photo of our club members at the games.